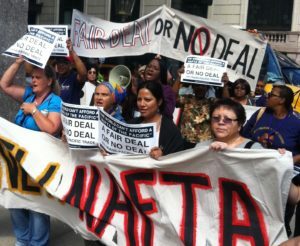 “The Trump administration’s current NAFTA proposal fails to include the critical changes necessary to protect jobs, raise wages, defend human rights and reverse environmental damage. Substantial additional changes are needed if the pact is going to provide real benefits to people other than corporate elites. “Each week, NAFTA continues to destroy livelihoods across the continent. Unfortunately, the deal on offer does not include the enforcement mechanisms for labor and environmental standards needed to prevent employers from moving jobs abroad to areas where worker rights and environmental protection are routinely ignored. “Without strong labor and environmental rules with swift and certain enforcement, Trump’s version of NAFTA will continue to facilitate the outsourcing of jobs, the suppression of wages and the dumping of toxins. While steps forward have been made in other areas, a NAFTA replacement without this fundamental fix is a nonstarter. “In addition, Trump’s proposal is significantly worse than the original NAFTA on access to medicines. We need trade policies that increase the affordability of life-saving medications — not ones that extend monopolies for pharmaceutical giants and raise healthcare costs. “Beyond failing to even mention climate change, the current proposal also seeks to maintain special rights for some of the planet’s most egregious corporate polluters. If allowed to move forward as written, these handouts to oil and gas companies would prolong NAFTA’s ongoing threats to our air, water and climate. Citizens Trade Campaign is a national coalition of labor, environmental, family farm, consumer and faith organizations working together to improve U.S. trade policy.